Yesterday, Boulder was enveloped in a miasma of mist. After three weeks of nearly exclusively sunny, often brilliant weather, a small system had descended overnight, dropped an anemic ~1" of snow, and then decided to hang around to just make things chilly. And dank. Nevertheless, except for the addition of a pair of tights and a stocking cap, the regular morning's ascent of Green Mountain was largely without incident. 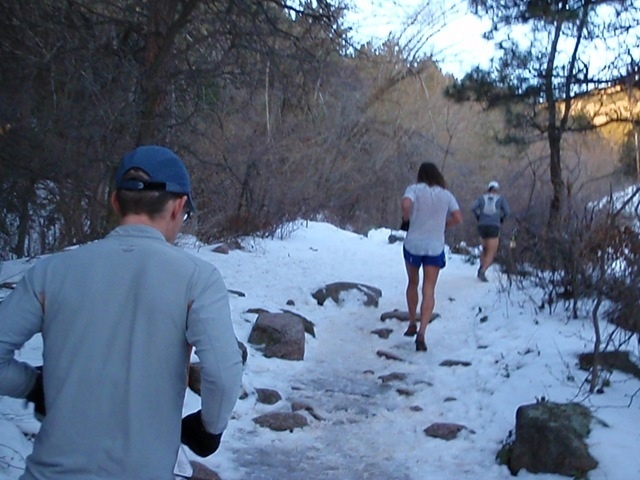 Running uphill through the new snow in the pre-dawn darkness did cause me to recall several other wintry early Thursday mornings with the Team CRUD folks in Cheyenne Canyon in Colorado Springs. Handicapped-start group uphill tempos were an excellent way to motivate a group of runners of widely-ranging abilities to all suffer a bit and then run the downhill together. During the past week I have felt my body navigating the avenues of stress and adaptation, alternate bouts of energy and fatigue, that typically occur when I've been fortunate enough to plug away at the training long enough to give myself a shot at truly becoming fit. This always happens about four weeks into a training cycle. The first week of a substantial build-up is marked by re-establishing the basic routines and habits of a serious runner. Oh yeah, this is what it feels like to get up before the sun every day. Or, ugh, two hours might be just a bit longer than my body is willing to consistently go right now. However, by the second week, everything is roses. My body is over the initial hump of being a real runner again but has not yet been immersed in the nearly ubiquitous low-level fatigue that comes with putting in the time day after week after month. Instead, the dregs of fitness have been reawakened and the spirit is doubly bolstered by still-fresh legs. Every run starts with a happy clip in the stride right from the doorstep, and some days I veritably bound up the mountain. The third week is...arduous. It tests the will, for sure. It reminds me of just how hard running can be. Accumulative, accreted fatigue settles in my legs and forces me to ease into every run with the utmost effort. If that last sentence appears contradictory, that's because it is. In the third week, running is contradictory; the perceived effort is fairly uniformly high, but the achieved pace does not correlate. Every run is slow. Thankfully, all that is required (as if this were somehow trivial) is some good old-fashioned stick-to-it-iveness and a hopeful eye to the future, knowing that the drudgery will eventually pay off. This past week was the beginning of the pay-off. Not every day felt good. In fact, most runs still felt pretty bad. But, from time to time I could detect a glimmer of solid, dependable energy (not the fleeting, somewhat fake energy of the second week) through the murkiness of fatigue. As all second-runs-of-the-day do, I started out feeling leaden and more than slightly unmotivated. However, by time we got to the trailhead and I started up Gregory Canyon I could feel the weight lifting and my body started accessing that well of fitness that I've spent all month filling. My Microspikes bit into the trail with purpose and I quickly ascended into the inky clouds with much less effort (and two minutes quicker) than in the morning. Standing on the summit, though, I was slightly disappointed with the lack of any sort of view, so after briefly scrambling atop the summit boulder I turned and headed home--the downhill was going to be the truly interesting part of the run, because if my knee was going to protest, it would be on the descent. Heading down Greenman (the upper section down to Saddle Rock is excellent for descending right now with an almost perfect amount of snowpack) I encountered no knee pain but was treated to a most excellent night-time view of the city as the clouds lifted virtually right before my eyes. This was the view I'd been waiting for all day and it sparked a stretch of that kind of running that only comes along every once in a while. Every footstep is perfectly placed without trying, the growing darkness adds a sense of increased effortlessness and speed, and the steep drops and rocks and roots all provide giddy moments of acrobatic proficiency instead of the more typical tired and awkward navigation. I'd forgotten how much fun it can be to run trails at dusk. By time I was cruising the streets back to my apartment I was more optimistic and satisfied about my running than I've been in quite some while. After my thirtieth Ascent of Green this morning, though, I was sure to remind myself that it is still very early. Early in the Project, early in the year, early in the season, and now is not the time to get greedy. Initially, I think a significant part of why running appealed to me--when I started running regularly 15 years ago--is because it is an activity that easily lends itself to the proclivities of a somewhat obsessive, somewhat compulsive personality. Emphasis on the qualifying somewhat's in that sentence. I don't think of myself as particularly obsessive compulsive in most arena's of my life---it only sometimes pops up in fairly peculiar ways. For instance, I am mildly compelled to always put my left shoe, sock, or glove on first, before the right. No particular reason why, it just feels right. When I discover a new band or song I often listen to it incessantly on repeat just because I enjoy it so much. I have made the exact same recipe of "African Stew" (containing such delicious and nutritious ingredients as quinoa, yams, kale, chickpeas, and peanut butter) three times already this month---twice for the same dinner guests. And, the obvious is that during particularly heavy training periods I can become especially draconian regarding the specifics of my daily or twice-daily runs. In the latter case, it can be argued that a little OCD is almost a necessary component to maintaining a rigorous training schedule. For whatever reason, running seems to accentuate this tendency in me. But, with regards to the running, I have recently decided, I think, to whole-heartedly embrace this tendency in a new way. With three weeks of 2010 already behind us---and still not a day missed on Green Mountain---I am highly tempted to strive for a goal that coalesces around a pair of particularly round numbers: completing, on foot, 100 summits of Green Mountain in the first 100 days of the year. To be sure, this is not really a unique proposition. In fact, it is virtually directly inspired by the fact that something very similar has been accomplished at least twice before. When it comes to habitually running up and down a Boulder Open Space and Mountain Parks peak, Scott Elliott is the unequivocal standard-bearer of sorts. At least twice in the last few years (2007 and 2009) Scott has managed to summit 8461' Bear Peak 100 times in the first 100 days of the year. Last year he apparently extended the monomania and ran up Bear 175 times in the first six months (182 days) of 2009. Scott's major racing accomplishments have occurred in primarily uphill-only races, most conspicuously in the venerable Pikes Peak Ascent, which he has won an astonishing eight times (with a personal best of 2:06:47), been second another four times, and finished a total of 17 times, only once out of the top ten overall. His prowess on that mountain is only surpassed by the virtually incomparable Matt Carpenter. The Boulder Daily Camera wrote this article during Scott's 2007 streak, and this Camera article from 2001 provides evidence that Scott's focus has not been limited to Bear Peak---it mentions a streak of ascending Green Mountain for something on the order of 115 days straight in preparation for that year's Pikes Peak race. Because of where I live in the city, I have chosen the 8144' summit of Green Mountain (and not Bear or South Boulder Peaks) as my daily goal. From my front doorstep, it is a 12-13 mile and just under 2hr roundtrip outing to the summit and back, depending on which trails I choose. I have a couple of reasons for pursuing this goal. First, as I implied earlier, it appeals to a powerful part of my personality. It offers a tangible goal in my running during a time of the year that is typically devoid of many races and instead is important and appropriate for establishing a rock-solid foundation of mileage and hours for the rigorous spring and summer trail racing season ahead. Second--and this is the most compelling and important consideration for me--I think it will actually serve to discipline me in my training to remain more conservative, less erratic, and therefore more consistently injury-free. How, one might ask, am I rationalizing that? My thinking is that by planning for a two hour run with big vertical every day I will not be tempted to push my training much beyond that on any regular basis because doing so might jeopardize my ability to go out and repeat the summit run the next day. By taking the long-term (at least 100 days) view I will--theoretically--approach each day's training with a reasonable attitude, that, instead of focusing on how much I can squeeze out of my body on any given day will place the onus on day-to-day, week-to-week, and month-to-month consistency. This is something I have regularly struggled with in the past, due mostly to my boundless enthusiasm and passion for running. In this past week, I have already seen the positive effect of Green's summit on my decision-making. On Tuesday I tested my knee with a nearly three hour Double Green run that (predictably) resulted in a little aggravation the last half hour of the run. On Wednesday, after yet another trip to the top, I was still feeling a little residual soreness in the knee towards the end of the morning's summit run, so I decided to forget about running in the evening so that I could be sure to run Green pain-free the next morning (which I did). In the past, I am almost sure that I would've gone for the Wednesday evening run and likely either forced a day off today or at the least not been able to complete such a fulfilling mountain run. Third, I find this kind of training run to be tirelessly enjoyable and inspiring. Maybe the single most satisfying thing to me in running is having the ability to self-propel myself---quickly and efficiently---to the summit of a mountain and back down. I love the defined goal that the top represents and I love the effort and process of making it to the top. The fact that Boulder has such picturesque, accessible peaks in such close proximity make this an even more natural choice in my training. The mountain itself is my inspiration. And so is Scott. In the Camera article from 2007, Scott suggests that maybe his efforts on Bear Peak could provide motivation for an aspiring athlete. Well, consider me inspired. 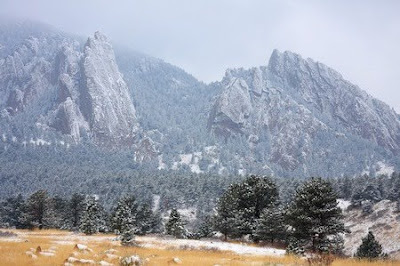 1) An "ascent" will only count if the run begins from no higher than the approximately 5600' elevation of the Chautauqua or Gregory Canyon trailheads. However, I anticipate that the vast majority of my ascents will begin and end at my doorstep (~5300')---a value (i.e., not driving to run) that is very important to me in my daily running. 2) An ascent must only be foot-powered and non-mechanized: running or hiking count, but no bikes and no motor-powered assists to the Realization Point or West Ridge trailheads off of Flagstaff Road. 3) I do not need to ascend every day. I can make up "missed" days with multiple ascents in a single day or single run as long as I descend at least to the Gregory Canyon trailhead (or equivalent elevation) in between each successive summiting. This allows for races, out-of-town trips, or other extenuating circumstances. 4) I will not risk over-use injury or the value of the inherent fun-factor. I subscribe to the "lite" version of obsessive-compulsiveness. 5) The entire project is completely on my honor. I'm not going to purchase and start carrying a camera for a time-stamped summit shot every day. The completion of this project shouldn't really matter to anyone but myself, so any transgressions of veracity on my part would be simply self-defeating. So, 21 days down and 79 days and 79 summits to go. Well, to get the most cliche part of this post out of the way as quickly as possible, it is a new year and that is exciting. Since this is (primarily) a running blog, I will probably (primarily) continue to discuss my life in that context, here, for whatever that is worth. Ever since the Leadville 100 in August, my running has mostly been...frustrating. There were several races I wished to compete in last fall (Vermont 50, Lithia Loop Marathon, Masochist, North Face 50, even Bandera last weekend), but that was/has all been precluded by a cranky little knee. It is the same injury that first surfaced last April and kept me out of Western States this past June, and it is persistent. It's not that I haven't been able to run. Quite the contrary. In all of 2009 I actually missed "only" 51 days (I employ the scare quotes because that still averages to nearly a day off every week) of running (compared to 118 in 2008), but curiously logged ~900 fewer miles in 2009 than in 2008 (~4300 vs ~5200). This is a function of my trick retinaculum/patella being pretty much happy with runs up to 2hrs in length, but nothing much longer than that. This fact makes the training and completion of an ultramarathon an especially sticky proposition. Any venture into the 4-5hr range of running duration has consistently led to a forced week or so of rest, waiting for the knee to quiet back down. So, with that knowledge, and the commencement of the new year, I resolved to limit myself to 2hr length (albeit, frequent) outings, and, combined with some new proactive measures (acupuncture, sacroilliac joint adjustments, abductor-strengthening exercises), I hope to only extremely gradually increase the duration of my runs from the seemingly magical 120 minute threshold. So far, it has been working. 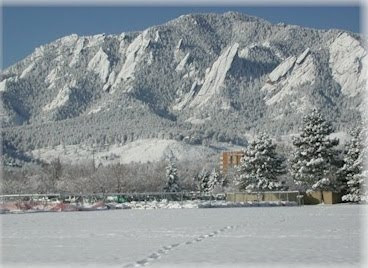 The first 18 days of 2010 have seen me log 18 pain-free 2hr runs, each of which has included the 2500'-in-less-than-three-miles climb to the 8162' summit of Green Mountain here in Boulder. Much to my joy, these daily sojourns have been greatly ameliorated by the Mountain Gods (and Microspikes). For the past ten days, Boulder (and, the rest of the Front Range, I imagine) has been regaled with consistently excellent weather--highs in the 50s, plenty of sunshine, no precipitation. This is the kind of stuff that makes me love the Front Range climate so much. So, in what state of flux does this leave any future (probably maligned and misguided) attempts at ultramarathon racing? Hard to say. I have several classic ventures bouncing around in my head with Miwok, Lake City, and Western States being the most prominent. The primary goal this year is to actually race a full, healthy season (I managed to finish one, count it, one actual ultramarathon last year--the White River 50). However, all of those events--despite my most rigorous and assiduous efforts--will surely require more than two hours for me to complete, so at this point, my participation remains largely theoretical. In the meantime, I absolutely plan to continue simply enjoying the relative health and ability I have been granted. Finally, I recently gave a rather extensive interview to the author of this blog. I found many of Mr. Babinski's questions to be refreshingly engaging, so I thought maybe some of my own blog readers might be interested in the topics covered.